Granular media, such as sand or industrial granulates, display properties that are not common to those of liquids or those of solids. We investigate such media, looking at their properties in the limit of extremely few (less than 40) particles. 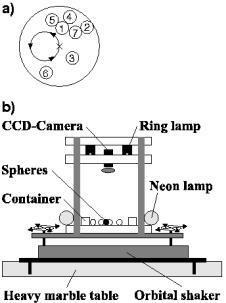 The system shown below consists of N spheres in a dish. They are swirled horizontally and periodically, so that the center of the dish describes a circle (a). 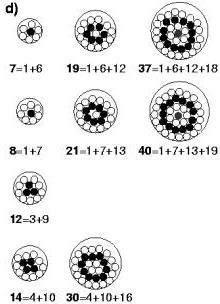 Only certain numbers ("magic numbers") of spheres organize into rings (d). This occurs within a wide range of swirling frequencies, swirling amplitudes, or dish sizes. Taking out a sphere from N=21 causes chaotic mixing (c). 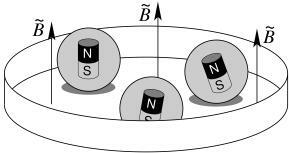 Putting back the sphere causes reorganization into rings; putting in another sphere (N=22) yields again chaotic mixing. The periodically tilted box shown below shows an intermittent route to chaos, on increasing the tilting amplitude or frequency. In other words, the system can display erratic transitions between a solid-like and a gas-like state. Shown below is the on-off behaviour of granular temperature. M. Markus and M. Schmick, "Intermittency in connected hamiltonian systems". Physica A 328, 335-340 (2003). M. Schmick and M. Markus, "Evidence for intermittency in a granular medium: experiments and simulations". 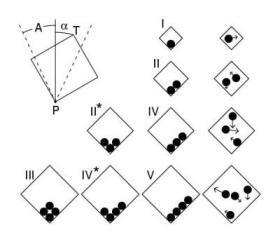 Discrete Mathematics and Theoretical Computer Science AB, 1-10 (2003). In the web. 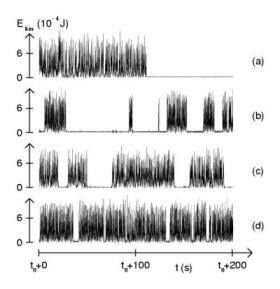 M. Schmick, E. Goles and M. Markus, "On-off intermittency and intermingledlike basins in a granular medium", Phys. Rev. E 66, 066214/1-4 (2002).